The community named after the newest city in Palm Beach County, Westlake, has been creating quite a buzz in the area with over 4600 homesites by builder Minto. Westlake is located in the western part of Palm Beach County off of Seminole Pratt Whitney Rd. The impressive 25 home floor plans in the Cypress and Indigo Collections will range in size from 2100 sf to 5298 sf with everything from 2 bedroom 2 baths plus a den to 6 bedrooms 4.5 baths plus a den and all will feature 2 or 3 car garages. All models offer high end designer details and finishes. Most models will feature 10’ ceilings, tile backsplashes as well as energy efficient and water saving appliances. The community will feature all that one would expect from a master planned community including but not limited to resort style pools with children’s play areas and splash pad, recreational park areas with pavilions and basketball courts, playgrounds and sidewalks throughout. Westlake Homes by Minto in the new City of Westlake offers 2 collections of homes with 25 home designs from to choose from. 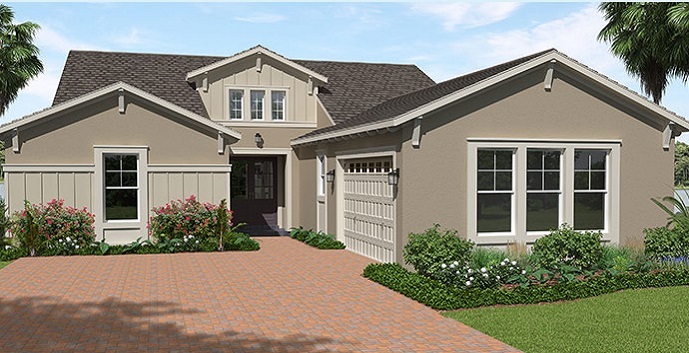 Sage - 1 story homes offering 2 bedrooms, 2 bathrooms, den, dining room, great room, covered lanai and 2 car garage. 2,174 total square feet. Cassia - 1 story homes offering 2 bedrooms, 2 bathrooms, den/3rd bedroom, dining room, great room, covered lanai and 2 car garage. 2,469 total square feet. Aster - 1 story homes offering 2 bedrooms, 2 bathrooms, den, great room, breakfast area, covered lanai and 2 car garage. 2,432 total square feet. Marlberry - 1 story homes offering 2 bedrooms, 2 bathrooms, den, great room, dining room, breakfast area, covered lanai and 2 car garage. 2,636 total square feet. 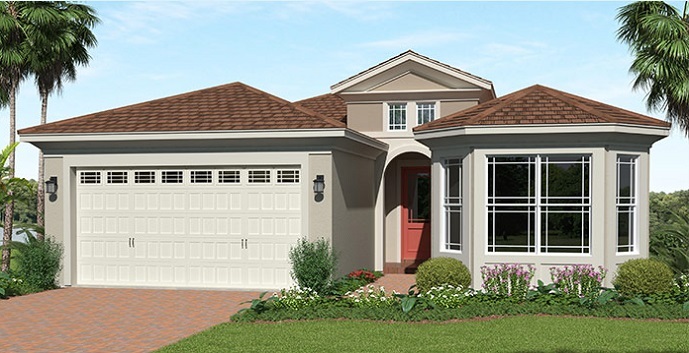 Persimmon - 1 story homes offering 2 bedrooms, 2 and 1/2 bathrooms, den, great room, living room, dining room, breakfast area, covered lanai and 2 car garage. 2,796 total square feet. Sycamore - 2 story homes offering 4 bedrooms, 3 bathrooms, den, family room, dining room, breakfast area, covered lanai and 2 car garage. 2,848 total square feet. 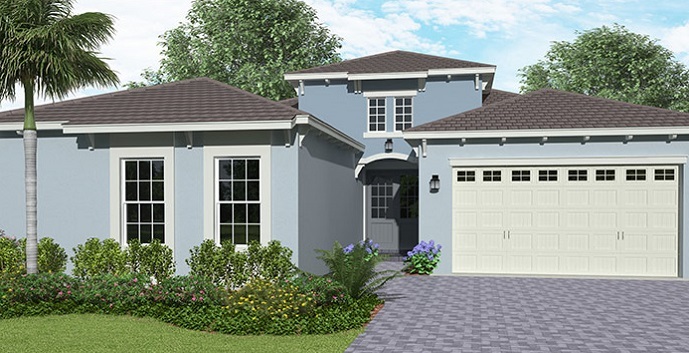 Schefflera - 1 story homes offering 3 bedrooms, 2 and 1/2 bathrooms, den, great room, dining room, breakfast area, covered lanai and 2 car garage. 3,032 total square feet. Azalea - 2 story homes offering 3 bedrooms, 2 and 1/2 bathrooms, loft, family room, living room, dining room, breakfast area, covered lanai and 2 car garage. 3,448 total square feet. Azalea Grand - 2 story homes offering 3 bedrooms, 2 and 1/2 bathrooms, media room, family room, living room, dining room, breakfast area, covered lanai and 2 car garage. 3,448 total square feet. 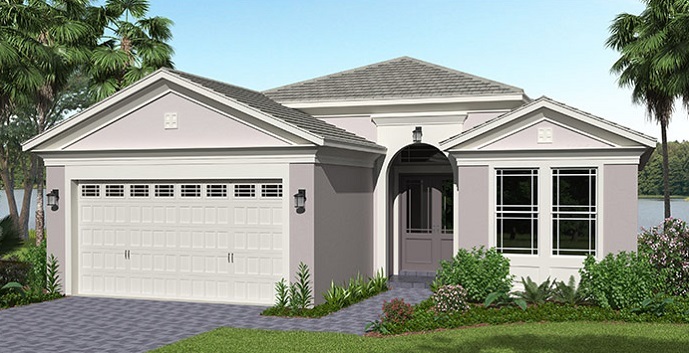 Poinciana - 2 story homes offering 4 bedrooms, 3 and 1/2 bathrooms, loft, family room, living room, dining room, breakfast area, covered lanai and 3 car garage. 3,777 total square feet. 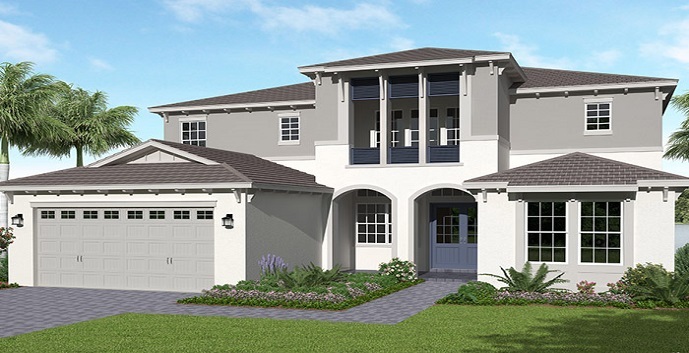 Poinciana Grand - 2 story homes offering 4 bedrooms, 3 and 1/2 bathrooms, media room, loft, family room, living room, dining room, breakfast area, covered lanai and 2 car garage. 3,777 total square feet. Laurel - 2 story homes offering 4 bedrooms, 3 bathrooms, loft, family room, living room, dining room, breakfast area, covered lanai and 3 car garage. 4,252 total square feet. Laurel Grand - 2 story homes offering 5 bedrooms, 4 bathrooms, loft, family room, living room, dining room, breakfast area, covered lanai and 3 car garage. 4,488 total square feet. Birchwood - 2 story homes offering 5 bedrooms, 5 bathrooms, den, loft, family room, living room, dining room, breakfast area, covered lanai and 3 car garage. 4,692 total square feet. Birchwood Grand - 2 story homes offering 5 bedrooms, 5 bathrooms, den, media room, loft, family room, living room, dining room, breakfast area, covered lanai and 2 car garage. 4,692 total square feet. Sandhill - 1 story homes offering 3 bedrooms, 3 bathrooms, den, great room, dining room, breakfast area, covered lanai and 2 car garage. 3,082 total square feet. Woodlark -1 story homes offering 2 bedrooms, 2 and 1/2 bathrooms, den, great room, dining room, breakfast area, covered lanai and 3 car garage. 3,708 total square feet. Kingfisher - 1 story homes offering 3 bedrooms, 3 bathrooms, den, great room, family room, dining room, breakfast area, covered lanai and 3 car garage. 3,797 total square feet. Woodlark Grand - 1 story homes offering 3 bedrooms, 2 and 1/2 bathrooms, den, great room, dining room, breakfast area, covered lanai and 2 car garage. 3,708 total square feet. Sanderling - 1 story homes offering 4 bedrooms, 4 bathrooms, den, family room, living room, dining room, breakfast area, covered lanai and 3 car garage. 3,805 total square feet. Kingfisher Grand - 1 story homes offering 4 bedrooms, 4 bathrooms, den, great room, family room, dining room, breakfast area, covered lanai and 2 car garage. 3,797 total square feet. Sanderling Grand - 1 story homes offering 4 bedrooms, 4 bathrooms, den, hobby room, living room, family room, dining room, breakfast area, covered lanai and 2 car garage. 3,805 total square feet. Kestrel - 2 story homes offering 4 bedrooms, 3 and 1/2 bathrooms, den, family room, living room, dining room, covered lanai, covered balcony and 3 car garage. 4,995 to 5,310 total square feet. 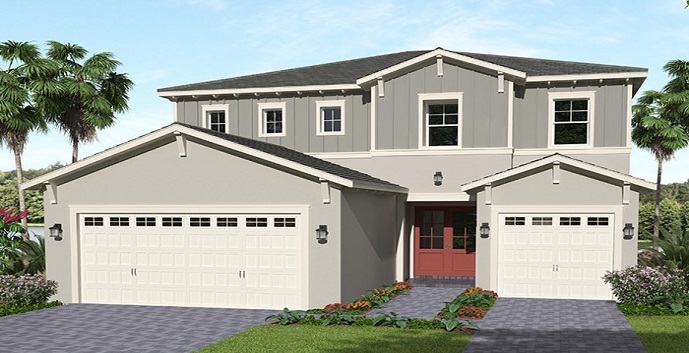 Kestrel Grand - 2 story homes offering 5 bedrooms, 4 and 1/2 bathrooms, den, living room, family room, dining room, covered lanai, optional covered balcony and 2 car garage. 4,995 to 5,428 total square feet. Tanager -2 story homes offering 6 bedrooms, 4 and 1/2 bathrooms, den, loft, great room, dining room, breakfast area, covered lanai and 3 car garage. 5,298 total square feet. Tanager Grand - 2 story homes offering 6 bedrooms, 4 and 1/2 bathrooms, den, flex room, loft, great room, dining room, covered lanai and 3 car garage. 5,298 total square feet.